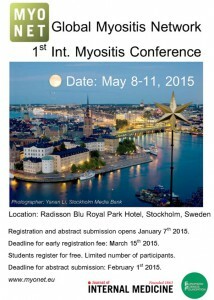 MyoNet is a global multicentre, interdisciplinary research project on inflammatory myopathies, myositis. ​MyoNet involves neurologists, rheumatologists, neuropathologists, pediatric rheumatologists, basic scientists and statisticians, with expertise in genetics, proteomics, epidemiology and clinics. New participants with an interest in understanding the pathogenesis of myositis are welcome to join MyoNet. The idiopathic inflammatory myopathies (IIM) are a rare group of autoimmune diseases, negatively affecting the lives of an estimated 250,000 people worldwide. Delays in diagnosis often occur owing to a lack of recognition of disease presentation, or misdiagnosis, both of which can lead to muscle atrophy. This new addition to the Oxford Rheumatology Library series focuses on providing a summary of what is currently understood about the epidemiology of myositis, controversies in diagnosis criteria, clinical features, and the current paradigms for treatment and intervention. Designed to bring together the multi-disciplinary involvement of healthcare professionals for IMM patients, this is the first easy-to-navigate guide for the practical management of myositis. This is an essential guide for both physicians and trainees in Rheumatology, Neurology, and Dermatology specialities. Myositis Masterclass is a two day educational inflammatory muscle course which provides a comprehensive myositis training package that will give attendees a complete picture of neuromuscular assessment and to improve overall quality of care. To promote awareness and disseminate best practice within the field of idiopathic inflammatory myopathy. To keep delegates up to date in new clinical developments within the field of idiopathic inflammatory myopathy. To enable knowledge transfer of standardized classification, examination methods, use of specialist diagnostic tools and assays, biopsy techniques, interpretation of muscle histology and treatment protocols. Trainees and consultants with an interest in muscle disease – from Rheumatology, Neurology, Dermatology or Internal Medicine. The meeting will foster collaboration between centres involved in myositis network and will discuss various aspects dealing with Myositis registry and current and future cooperation. The expected number of participants is around 50 for whom the meeting and accommodation for one night will be covered by organizers. International collaboration research and treatment registry. This EuroMyositis registry has been created in order to obtain uniform, longitudinal data over adult and juvenile myositis cases in order to achieve increased knowledge on disease course and prognosis of myositis. In addition, this registry could be used as a tool in the clinic to assess patients. For more information and to become a member, please follow the “Read more” link. The Myositis Association is pleased to be able to offer more funding and larger grants than in recent years. Funding is available for up to $250,000 over 2 years for research into any type of immune-mediated myositis. Also, some of the available funding is specifically set aside for fellowships. Research Fellowships – to support a young physician, or PhD scientist, who is beginning a career in myositis research in the laboratory of an established myositis investigator. 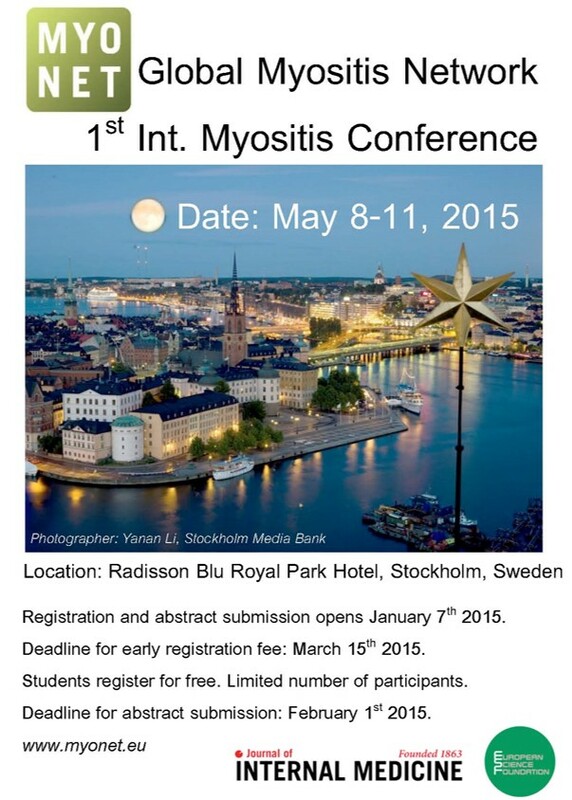 Research Grants – to support new or innovative myositis research projects. For more information, visit www.myositis.org or email TMA@myositis.org. Since the EuMyoNet now has evolved and also includes groups outside of Europe, the Steering Board has decided to re-name the network to Myonet. In conjunction with this change, this new website has been created. During 2013, the old www.eumyonet.eu site, will be linked directly to this side, but from 2014 the old address will not be valid. The project has now been up and running for a little more than 2 years, and the Coordination team has just submitted the mid-term review. The outcome of the review will be communicated to all members of the consortium when available.